We’re receiving word from a few readers that are having trouble completing the necessary Brewfest achievements to complete the holiday meta-achievement. The concern is from readers who did not start attaining Brewfest Prize Tokens early in the event or are otherwise not able to play regularly enough to get the tokens. So, while drinking beer in WoW is fun in and of itself, there is still some work to be done for many players. Brewfest differs slightly from other in-game holiday events in that the currency for the items required to complete the related achievement is not ‘grindable’ in a single extended play session. Rather, amassing the Brewfest Prize Tokens requires a much smaller time investment, but stretched out over several days. To those players that can only log on a few times a week or for very limited amounts of time per day we offer the following tips for attaining all the necessary tokens and, hopefully, getting your sweet violet drake. Know that your goal is 350 Brewfest Prize Tokens. This is the exact minimum amount you need to complete the event. The reason you only need 350 is because if you purchase the Brewfest outfit for 350 tokens, and immediately complete the related achievement, you can then return the clothing to the vendor for a full refund of your tokens. You then use 200 of these tokens to attain your Brew of the Month club membership and the other 150 can be spent as you wish. Pet collectors might want to spend 100 on the Pint-Sized Pink Elekk. After completing all the regular quests, there are three ways to attain more tokens, two daily quests and the keg delivery pseudo-daily. These quests are explained clearly on several sites, perhaps our favorite of which is WoWhead. The two daily quests are self-explanatory but the keg delivery aspect is a little more in-depth. The first thing to note is that, unlike other daily quests, this one can be completed once every 18 hours set on an internal timer. In theory, you can complete this part twice a day. The keg running pseudo-daily has two locations of apple barrels along the path that will remove your mount’s exhaustion debuff. There are also similar barrels at the start and end of the route. Familiarize yourself with the route and the location of the barrels prior to starting the quest. WoWWiki does a fantastic job of going into extreme detail on this subject. Definitely give that a read if you want to perfect your strategy. If you’re having problems finding a good location to complete Drunken Stupor without dieing, it helps to know that you can be shielded or immune and still complete this (including having a palli use DI on you). We really liked the advice on locations provided by WoW.com for this one. Go check it out. An entirely different Drunken Stupor achievement. Speculation on the post-event secondary market of Tankard O’ Terror. Zekta with a neat tip on how to get more out of your group’s Direbrew summons. Wonder what you’re missing out there in the RL version of Brewfest? Here is some motivation to make it to Munich next year (both links are safe for work but just barely). September 19th is international Talk Like a Pirate Day and in celebration Blizzard is holding a corresponding in-game event, Pirates’ Day. WoW profit seekers will find some, limited, opportunity to profit that we will discuss below. The event lasts a single day. There is no requirement to participate or perform any sort of activity. There is one achievement associated with the event, it is categorized as a World Event achievement, but has no impact on the world events meta-achievement. The majority of activities will take place in and around Booty Bay in Stranglethorn Vale. There is no title to be attained this time around. Sorry to all you out there. The major opportunity for profit comes in the form of players that want to get into the pirate spirit and dress up in pirate regalia. Just My Two Copper points out that the best, most profitable, opportunity to do so will probably be the crafting and distribution of the Admiral’s Hat. The tailoring pattern to craft this item is purchased from Cowardly Crosby, an NPC near Booty Bay. No reputation with any faction is required for purchase but the recipe is a limited item, sold in single quantities and on a conservative two-hour respawn timer. It is our opinion that JMTC is correct in their assessment that the limited supply of the recipe will drive the asking price of both the recipe and the crafted result to peak prices during the event. As they also note, the materials required to craft the item could spike in price. In our opinion, it his here that the opportunity for profit truly shines. While the hat and recipe will certainly be limited in supply, the Long Elegant Feathers (of which you need 6) will be much more limited in supply. Of further benefit the supply of the hat pattern will be extremely limited if you don’t have it but the feathers themselves are quite easy to come by… provided you know where to look. The post from JMTC has a nice video outlining a farming technique for attaining the feathers. Here are our assessments of where to go to farm these potentially profitable items and some additional reasons to farm these specific locations. The Horde actually has it a bit easier on this one in that their target mobs have a slightly higher drop rate. The area is The Hinterlands and Hillsbrad Foothills. The target mobs are the various Razorbeak hippogryphs found all around The Hinterlands. The two useless ‘guards’ to The Hinterlands at the start of the trail in Northeast Hillsbrad Foothils also drop the feathers. The listed drop rate is approximately 40% but our experience was slightly less than that. While in the area, keep an eye out for farming opportunities, as the area is rife with herbs that sell quite well. Note that the mobs here are friendly to alliance players and thus cannot be killed by even the most traitorous Alliance members. Also, since you’re in the area, be sure to visit the secret path to The Western Plaguelands called Plaguemist Ravine. Starting just North of Shindigger’s Camp, this narrow, mob-free path harks to the old school style of WoW development when hidden paths and locations were the norm. Many newer players are unaware of its existence. Another place you should most certainly visit since you’re so nearby is the NPC George Candarte just East of the entrance to The Hinterlands (East of the aforementioned two useless Gryphons). See, Ol’ George sells the Leatherworking pattern for Green Leather Armor which can resell quite well in the AH. This limited recipe is on a 20 minute respawn timer and is the only NPC in the game that will sell it to The Horde. The NPC is Horde allied and thus cannot be bought from by Alliance players. If you are an Alliance player and you’ve decided to come check out this zone anyway, just go ahead and kill the NPC because –and let’s be honest here– you’re Alliance and that’s exactly the kind of s**t you like to pull. WoWhead lists several Alliance options for farming the feathers but not all are equal. For starters, the mob they list in Hillsbrad Foothills is literally a single mob. With a drop rate in the area of 35%, that’s a long time spawn-camping a single mob for infinitesimal returns (but hey, you can kill Ol’ George over and over as he respawns faster). The other options are to kill Witherbark Hideskinners, again in the Hinterlands, or to head out to Feralas or or Azshara in search of less friendly Hippogryphs. We prefer to do this because the Hideskinners have the lowest drop rate of all the options (around 10%) so the farming can take longer. Our preference is Azshara because it provides a few other options along the way. The target for Alliance is Thunderhead Hippogryphs in Azshara. These mobs can be targeted by both factions and PVP-server players would do well to note that there is a Horde camp nearby, Valormok. It’s easy to tell when you’re getting close, however, since the farming area is downwind of the camp and you can smell the stench of Tauren as you near the camp. The farming area is the extreme Northwest portion of the zone along the cliff overlooking the river that flows from Winterspring. While in the area, if you can farm it, keep an eye out for Dreamfoil and (one of our old favorites) Tin Ore. If you haven’t previously quested in this zone you may also wish to pick up the Encoded Fragments quest before you start farming since you can easily finish it while farming. While here, you also want to look for the rare spawn, Antilos, a Gryphon that often spawns in this very spot. Also of interest, there is a neat fortuneteller’s table (replete with crystal ball) at the extreme northwest portion of the cliff closest to the waterfall. Although there’s no NPC at the table, someone should have predicted the fortune of the fishermen from the boat in the water far below. The boat appears abandoned but closer investigation reveals a few dilapidated underwater traps with skeletons nearby. Kind of reminds me of my own experience with the sport. The Hippogryphs you are targeting in this exercise don’t always have loot on them. This harks back to the old days of WoW, before every mob gave you a little something and epics were handed out like candy. And yes, we used to have to trudge ten miles in the snow to get to raids. With no mounts even! It should also be noted that there are superior pirate hats out there, but our understanding is that to attain one you have to be at least partly insane in the membrane. Most quests in WoW offer some form of physical reward in addition to the gold or XP gained from the quest’s completion. Following the steps outlined in this short guide will help make certain that you pick the best rewards for your needs. If the item is something you intend to use the choice should be fairly easy. You’ll want to remember that items equipped while leveling are transient in nature meaning that just because an item seems useful now that doesn’t mean it will continue to be for very long. As most quests are completed at or near the recommended quest level, the items rewarded for quest completion are often even more prone to becoming obsolete than a crafted item or BoE drop that you might purchase from the auction house. The other concern when selecting a quest reward for usage is that you might find it helpful to select items that address whatever issues you may be having. If you’re having a hard time with survivability, for example, select items with stamina. If mana regen is your issue, choose something with MP5 or spirit. Don’t simply go for the items that seem to suit your class or build. Remember, leveling and end game are different modes of play and benefit from differing approaches. The final consideration is that, in the rare occasion when all things seem equal, you might want to choose the item with the highest item level. For almost all quests the item levels of the rewards are the same but there are a few instances when this is not the case. Patch 3.2 allowed the viewing of the item level but the feature needs to be enabled by the player. To enable item level viewing go to the options screen, select ‘interface’, ‘display’ and then check the box labeled “show item level”. When selecting items to be sold to a vendor you obviously want to pick the item that will sell for the most money. Until very recently, you would have to rely on one of several add-ons or mods to view the vendor price. As of patch 3.2 however, you can see the amount for which every item will sell. The conventional wisdom holds true in that higher DPS weapons sell for more and armor value is a good indicator of vendor price for armor. Just remember to make note of this feature while questing as a lot of old school WoWers are likely to revert to the old guessing game before even noticing this recently added feature. A final thing to bear in mind is that it is almost never worth buying a BoE drop item from another player while leveling. As stated above, if you’re actively playing the game the item will be outdated soon enough as you progress through the game. The exceptions to this rule of thumb are trinkets that do tricks like regen health or mana or increase a certain stat (as these items can be quite unique even in the end-game), weapons (which seem to stay relevant for longer), off-hand items (good ones are harder to come by) and items in the ranged slot (librams, etc.). Sometimes you just want to kill stuff. We understand. For all the in-depth auction house trading strategy, WoWenomic theory and complex profession manipulation there are times when you just feel like crushing some skulls. The Fast Frenzyheart Farming method is a simple remedy for this feeling with the added benefit of being efficient and profitable. Allied with The Oracles. Sorry, Frenzyheart Tribe allied players cannot do this trick. Ability to withstand or escape 5 to 10 thousand incoming points of damage. In the semi-random rotation of Oracle daily quests within Sholazar Basin there is a quest that requires you to kill 50 of the Frenzyheart attackers and provides you with a few crystals to assist in making this happen. The quest, Mastery of the Crystals, involves picking up the crystals and using the magic they hold to quickly kill off the Frenzyheart Ravagers in the opposing camp. You don’t need the crystals to kill them but their use will very much speed up the process. If you do use the crystals to do the deed, however, the bodies of the mobs cannot be looted. But if you tap each mob, even doing as little as a single point of damage to it, you can get the kill credit and the resulting lootable corpse. Our favorite way to do this is to get the largest possible group of mobs together at once, pop all three crystals and then use any kind of AoE ability to hit the mobs before they die. This usually kills about 30 mobs in a single attempt if you choose the right location. That perfect location is the Sholazar coordinates of 22, 79 (or the circle of Frenzyheart Ravagers) just Northwest of the camp in the Southern corner of the map. The mobs at this location are already grouped, relatively low in health, respawn in under two minutes and drop enough loot to make this venture both fun and profitable. After an hour or so of killing these mobs in this fashion we usually have a full stack of healing potions, about 10 mana potions, almost a full bag of scrolls and about 100 gold. The quest does not have to be turned in after hitting the requirement so just keep killing and looting until your bags are full. Provided you always tap the mobs, and can survive their concentrated aggro, it is easy money. One of our team members actually pointed this trick out to us in a recent discussion about alchemy. He said that he never buys healing potions from other players. He simply keeps this quest in his log and the crystals in the bank and kills these guys for a few hours whenever he needs to stock up. If you’re unable to hit all the targets because your class has no form of AoE remember that anything will do here. Exploding corpses or pets, damage causing auras or our personal favorite AoE hack will work as well. Just be sure to bandage up and loot the corpses before they respawn as the timer is quite short. Of course, it is this short respawn time that makes this method of farming so profitable. Go forth and farm (and vent some frustration on the dog men). When flying to Coldarra, save yourself a little change and fly to Amber Ledge instead. It’s only a savings of 50 silver, but if you find yourself going there why not just take the transfer and save the money? To do so, simply talk to the big red flight master drake, Surristrasz, and select the first of the two dialog options and your flight from Amber Ledge to Coldarra will be free of charge. Now this would normally be enough of a savings to motivate cheap bastards like those of us behind this blog but, as Coldarra is a bit of a bottomless pit if you get summoned there before you can fly, Blizzard has built an option to also return to Amber Ledge free of charge. Many players don’t realize it but directly across from the Coldarra flight master there is an NPC by the name of Librarian Tiare who will instantly port you back to Amber Ledge thereby saving you the 45 silver return cost. Yes, it is strange that it costs 50S to get there and 45S to leave but by this we can only assume that Coldarra is the New Jersey of Northrend and so the best thing about it is the cheap travel to more desirable locales. Kidding… we’re kidding. No need to whack us dear neighborly mobsters. With the combination of free flight and a free portal this simple mechanic can save you both time and gold so there is no reason not to amend your Coldarra travel plans and save a bit when you can. Oh, and as long as you’re headed to New Jersey Coldarra be sure to help them with their nefarious drake exploitation plans as it is such a fast and easy daily and also take a look around for ‘The Don’ of the zone himself, Old Crystalbark. We’ve seen him there several times now that far fewer people are questing in the area. My First Gold is a regular column dedicated to helping players level 20 and lower to start building their WoWenomic empire. Following these tips should help new players (and alts) expand their WoW wallets to afford training, trade skills and have a few gold left in their pockets. Higher-level players may find benefit in these tips as well, but every tip herein is intended to be within the capabilities of a player below the 21st level. We are not big fans of farming (at any level)- we find it to be impractical as compared to other gold-making strategies unless you can group up several tasks at once for maximum efficiency. Today we’ll explore just such a grouping opportunity that can allow even a low-level character to make a couple of hundred gold in an hour while only having to deal with mobs lower then level 10. It is rare that a lower-level player has the opportunity to sell an item to a player at the level cap. Yet the Children’s Week meta-achievement provides just this sort of opportunity. As we mentioned last week in our Hot Item of the Week feature, Delicious Chocolate Cake is a required item as part of the Bad Example component. In that post, commenter and fellow WoW blogger Glinda pointed out the profit potential of supplying the other junk foods required for the achievement. This, in itself, is great advice since at least one of these items is sold in the cities on both Alliance and Horde sides. So it’s simply a matter of picking them up and putting them in the AH. Keep in mind that you should first check the AH price of the items prior to attempting to purchase them from a vendor for resale to be sure that you can still make money on the trade (prices are much lower now, half-way through the event, then they were at the start). While there is certainly opportunity and a small profit to be had by going to various vendors and selling these ingredients in the AH for a small margin, the big opportunity for lower-level characters comes in the form of farming Small Eggs and Mageroyal. Both of these items are easily gathered by almost all players but often a high-level player will not want to bother with going out to get them. Thus, an aspiring lower-level player can go farm them, while picking up some experience points and perhaps some gear, and resell them in the AH for a nice sum. A list of all the locations from which you can find Mageroyal spawns is listed here. A list of all the mobs that drop the Small Eggs can also be found on WoWhead.com via the link posted above. Ideally, choose the mobs with the highest listed drop rates. Note that when you’re selling the ingredients and other achievement materials you don’t want to flood the auction house and push the market lower. List five or six at a time at most and re-post as needed. Our particular favorite place to get small eggs is Azuremyst Isle, the Draenei starting zone. 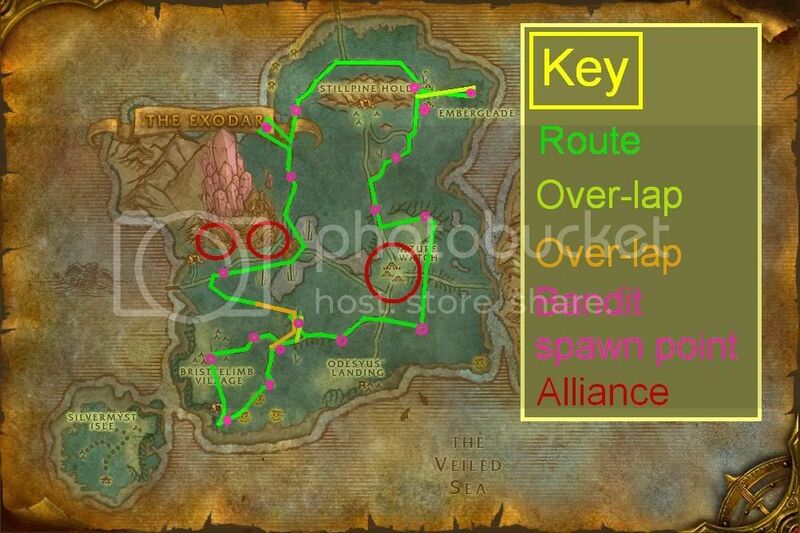 An Alliance area, this zone is much easier to access to those on the alliance side but still reachable by Horde as well. There are several mobs in the zone that will drop the eggs that we’re after (with the further benefit of a comparatively high drop rate). These mobs are fairly well spread throughout the zone but this gives us ample opportunity to farm a few other items along the way. First, for Alliance toons, note that one of the unique benefits of this zone is that there are no less than five ‘drop quests’ available from mobs within the area. All of these are quick and easy to do as they involve no effort beyond killing a few low-level mobs (all of which you’ll encounter as you search for your egg mobs) and take a minimum investment of time. Of the mobs that drop these quest items, one of them is the Blood Elf Bandit. This mob should be searched for and killed every time you see him as he drops a highly profitable item, the Blood Elf Bandit Mask. This head-slot item has an extremely low level requirement (5), does not bind on equip, has no armor type requirement and looks pretty darn cool to boot. We regularly sell them for 40 gold each (confirmed on two different servers) in the AH. The drop rate is about 10% so you may have to kill a few mobs before you get one. As the target is stealthed, you might want to refer one of these maps for spawn points. Further, using a macro such as ‘/tar blood elf bandit’ will help you locate him if you’re having trouble. Remember that, as with the eggs and herbs, you don’t want to flood the market if you pick up more than one mask so you can keep the price high. List one at a time and maximize your profits. You may also want to develop a bid and ask strategy for the item in the rare but possible event that someone else on your server is also farming the mask.